Most sailors, myself included, are die-hard romantics, suckers for the idea of sea spray, free-living, and adventures just over the horizon. Perhaps one of the ultimate sailing fantasies however is boat building. Felling a carefully chosen tree, shaping timbre with your hands, the smell of sawdust in the morning… If you’ve ever had the thought, “Maybe I’ll build a boat one day,” then you’ll appreciate Ruth and Garrett Jolly’s story, building a 35 ft. wooden boat, in the depths of the Washington wilderness. A short drive from the small community of Snowden, Washington about 2,320 miles above sea level, are the workings of a soon to be launched 35 ft. wooden gaff rigged ketch. 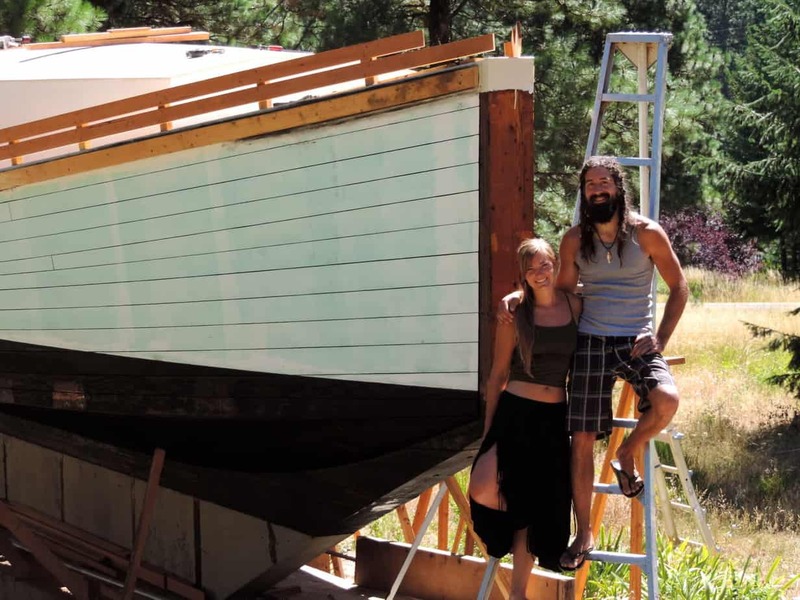 Ruth and Garrett Jolly have spent the last two years employing age-old techniques, in crafting their dream vessel. They live on-site in a toy travel trailer with no electricity or running water, battling the harsh Washington winters to bear their project to fruition. I learned about Ruth and Garrett after coming across an episode in their popular vlog, “Salt & Tar” in which they walk into the woods to select and fell a tree for the mast of their boat. I was curious to know their story. In this age of power and plastic, what motivates two 24 year olds to build a wooden boat in the dark woods of Washington? My curiosity piqued, I had a video call with Ruth and Garrett and we talked about what had propelled them on this boat building adventure. Garrett grew up on the central coast of California. As a kid he remembers him and his brother being inspired by the film “Water World” and shortly thereafter fashioning a vessel out of two abandoned kayaks, plywood, PVC, and poly-tarp; proudly dubbing it the “Crackermaran”. “We launched it into the bay,” Garrett explained, “Of course that didn’t work very well but it was still pretty cool. That was the beginning.” Garrett went on to fix up several orphaned boats: an 8 ft. Sabot that he found with a tree growing out of it, a 14 ft. Lido, and a crippled 23 footer with a 4 x 3 ft gouge at the deck-hull joint. At the age of 12 or 13 he built his first boat, a 21 foot dory style gaff cutter. Ruth explained they had limited resources, “We’re not trust fund babies, we don’t have a whole lot of money to be pouring into this but we have the passion.” They initially funded the project with the proceeds from selling their last boat. It was enough to buy a truck, tools, and a toy travel trailer. They lived simply with no electricity and no house. In the beginning Ruth worked 3 days a week in town serving a little pizza joint. “That was my one rule,” said Garrett, “That Ruth was not allowed to work more than 3 days a week. Because we don’t need a lot of money, we just need enough to get by.” They soon began filming their experience and posting on YouTube, quickly developing a following, which has helped them fund their project. What advice do they have for other young people looking to build a boat or get into sailing? Ruth and Garrett will soon be trading in saw dust for sea spray, when they launch Rediviva and set off on their cruising dreams. To follow their adventures go to https://saltandtar.org/.